Eric and Jill Skokan met working together and love working together on Black Cat Farm and their two restaurants that it fully supplies – Black Cat Bistro and Bramble & Hare. Farmers by day and restaurateurs by night, Eric and Jill literally embody Black Cat’s full farm-to-table operation. Eric, both farm manager and James-Beard nominated chef, cooks in the open kitchen and Jill, expediter and communicator, is right there on the floor with him facilitating between the front entrance and the food. Managing employees is a whole other piece of Black Cat’s operation that Eric and Jill love. Eric is fluent in Spanish and the Skokans bring Mexican families to Black Cat Farm on a H2A VISA program, house, arrange all transport and care for them. Most of the restaurant staff have been with Black Cat since its inception. The Black Cat family share a great work ethic, passion and aligned value. Black Cat is the largest full-scale farm-to-table operation in the country! “Full-scale” means all of the food on their restaurant tables year-round comes from their Farm: from vegetables to meat, grains, polenta, wheat, farrow, edible flowers and herbs. The menu changes daily and seasonally according to what’s harvested that day. 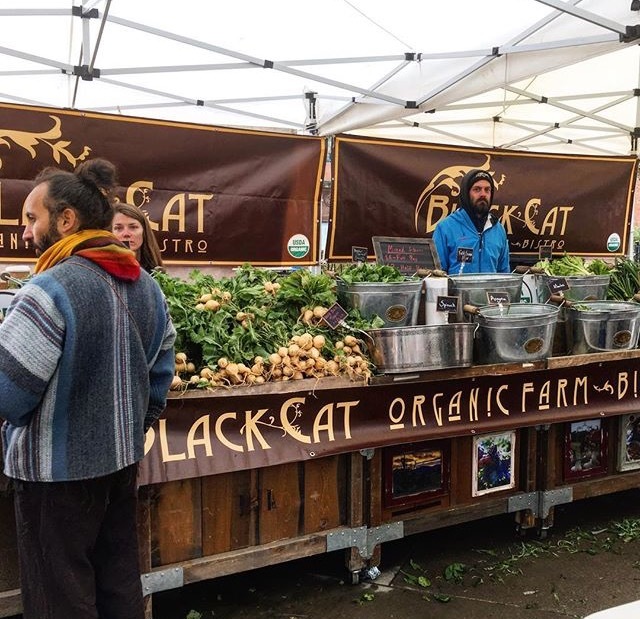 Black Cat Farm has been in business since 2008, and started selling at the Boulder County Farmers’ Market the same year. In what began as digging up the side and backyards of their rented North Boulder home to garden vegetables and raise chickens evolved to a three-family co-op, and later scaled into tractors and irrigation ditches. As they moved and expanded to various city and county open-space plots over the years, Eric and Jill added pigs and sheep. Black Cat’s 130-acre Certified Organic Farm depicts a central aspect of farming in Boulder County. Black Cat Farm is holistic – all of their livestock are pasture-based and biodynamic. They rotate their livestock and vegetable crops, integrating their animals into the crops. The animals fertilize the vegetables, and continually replenish the soil. It’s complicated. It involves timing and requires more space than importing fertilizer. And there is a beauty behind it that feels good: the pigs love it and the Skokans haven’t bought pork in eight years and pork has been on Black Cat’s menu every day. To build the soil, pasture the animals, raise organic vegetables and supply the restaurants is a win-win. Old-fashioned shell peas and wheat: two crops where we can have our cake and eat it too. Both are great for soil building and at same time, so useful and delicious in the kitchen. The performance of both depends on the weather being neither too wet nor too dry; so these “goldilocks” crops come with a healthy dose of fingers crossed. Early Spring: Asian greens – so sweet and delicious. Early Summer: Old heirloom shell peas come into their own. Late summer: baby summer squash and squash blossoms – the trick is to harvest small and often. Early Fall: black prince tomatoes – deep rich flavor, lower acid. Spectacular cooked as a roasted or dry tomato with a drizzle of olive oil and a sprinkle of salt. Farm-to-Table is run completely different than anything. Years ago, Eric and Jill were in France and it became their inspiration. The chefs were pointing to the farms where different proteins came from, and running out to garden for different herbs. It was a lasting experience. Farm-to-Table is not new; it’s old. There are many models and all are important. Black Cat’s particular holistic, full-scale approach is high integrity, both challenging and rewarding. Not everyone has the bandwidth to do both farming and a restaurant. There is a lot of training for young people coming into the industry: how to cook seasonally; how to use what’s coming off the farm; how the menu changes every day; whole-animal butchery. Making farming sustainable is part of the fabric for all farmers, and how to do it depends upon each farmer’s skill set. Black Cat happens to be farm-to-table and their restaurants and cookbook make their farm sustainable.